birth certificate number according to the information given to KNEC. In case the birth certificate number was not provided during registration the student should use their KCPE index number as the password. click on PROGRAMMES & COURSES. For you to access a particular programme click on the group within which the programme falls in e.g. if it is education click on it. Click on the particular programme that you want to pursue i.e. 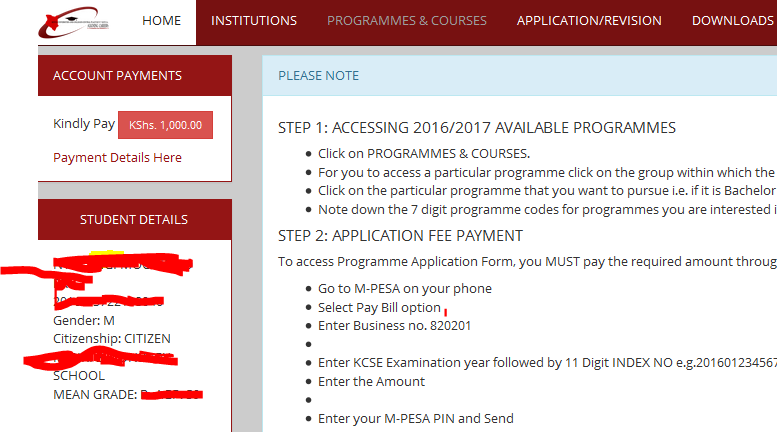 if it is Bachelor of Education (Arts), click on it. Note down the 7 digit programme codes for programmes you are interested in so you can fill them in later. The choices you have made will be displayed if you have completed the form without errors. If you find errors indicated in red, correct and save again. You MUST Log out when you have finalized with application. This is necessary so as to keep your application information safe.